This volume (CUP 2018) is the first holistic investigation of Roman literature and literary culture under Nerva, Trajan and Hadrian (AD 96–138). 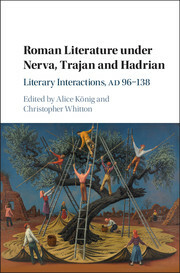 With case studies from Frontinus, Juvenal, Martial, Pliny the Younger, Plutarch, Quintilian, Suetonius and Tacitus among others, the eighteen chapters offer not just innovative readings of literary (and some ‘less literary’) texts, but a collaborative enquiry into the networks and culture in which they are embedded. The book brings together established and novel methodologies to explore the connections, conversations and silences between these texts and their authors, both on and off the page. The scholarly dialogues that result not only shed fresh light on the dynamics of literary production and consumption in the ‘High Roman Empire’, but offer new provocations to students of intertextuality and interdiscursivity across classical literature. How can and should we read textual interactions in their social, literary and cultural contexts? Reviews: “This collection is a jewel box of polished literary paidia, juxtaposing familiar works in unexpected ways and throwing new light on some well-known textual and authorial relationships.” Teresa Morgan, ‘View from the Bridge’, TLS 1.3.19. See also reviews in: Classical Review, CJ-Online, BMCR.